The Basics arrived in Jacks Valley, received some opening remarks from the Commandant, and then got to work setting up the place. Of course, many of the main structures are already set-up - storage facilities; latrines - since these are permanent wood and/or steel buildings. 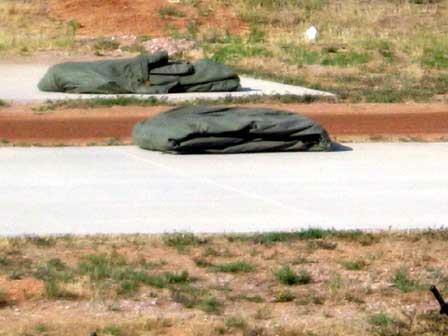 Their duffel bags will be pre-positioned in their designated squadrons area. 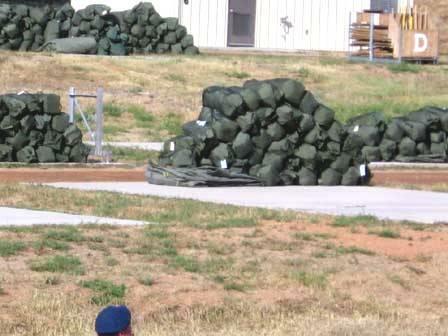 Here you see a shot of the duffel bags from a few years ago. In the back right of the photo, you see the letter "D" on a wooden bin. In the bin are the tent poles for the Demons. They will have some of the Demon basics get these poles while the others unfold and lay out the tent properly. Then, they will begin the set up.